Southeastern Massachusetts Index Monitoring Well Network - Updated Feb. 2007! Download Monitoring Well locations for viewing with Google Earth (500 KB KMZ file, requires Google Earth to be installed). 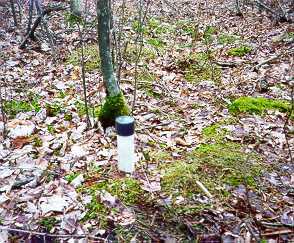 A network of shallow (generally less than 10 feet deep) soil monitoring wells have been installed on various soil types, geologic deposits, and landforms in Southeastern Massachusetts (Plymouth and Bristol Counties). The wells are used to monitor seasonal water table fluctuations to assist town Boards of Health and Health Agents guide onsite wastewater disposal system location, design, and permitting. The wells also provide important soil data such as depth to seasonal high water table and period of time the water table exists. This data is then provided in published in County Soil Survey Reports. This program is joint effort between the USDA-Natural Resources Conservation Service, Massachusetts Coastal Zone Management, the Buzzards Bay Project, and local towns. The monitoring wells were first installed in the Buzzards Bay Watershed beginning as early as 1991. Over 60 wells have been installed in the Watershed, some of the wells are still being monitored periodically, others were destroyed or access to them denied. 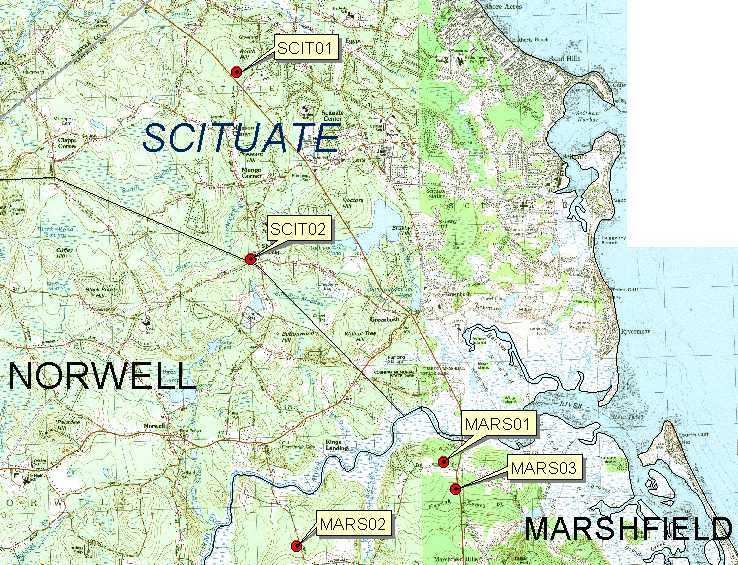 In 2001 a network of wells is currently being installed in the upper portion of the South Coastal Watershed, as of January 2001, 5 wells have been installed in Scituate and Marshfield. Plans are to install several more wells in the area. Site selection for the monitoring wells were chosen based on a series of factors such as access to the property, ease of access for recording the data, hydrologic conditions, soil and geology type, and landscape setting. Once an appropriate site is selected a small hand-dug test pit is dug and a log of the test pit is recorded following standard USDA-NRCS soil morphology description procedure. Logs of the test pits are used to determine soil properties such as permeability, depth to redox morphology, soil parent material (surficial geology), and soil classification. The pits are dug to a depth of 65 inches or as deep as possible with the equipment used during the installation. After the pit is dug and described, a mechanical drill is used to core as deep as possible for the well. A 2 inch screened PVC well is then installed following the procedure outlined in the WRP Technical Note HY-IA-3.1 Installing Monitoring Wells/Piezometers in Wetlands, August 1993 (email to receive a copy). The pits are then filled back in with the soil material and sealed with bentonite clay. After installation, the wells are checked on a regular basis and the depth to water is recorded for each well. The frequency of readings varies from time of year. During the summer months when the wells are dry, they are often just checked once a month unless a rain event occurs. If water is detected observation frequency is increased. During the spring and fall as water tables rise, the wells are checked bi-monthly. On some of the wells data on soil and air temperature is also recorded along with climate history and vegetation observation (budding condition, leaf fall off, etc.). Soil temperature is recorded using a temperature probe installed at a depth of 20 inches (50 cm), this depth is used for soil classification (temperature regime). Soil temperature is very important to determine when the growing season starts and microbial activity starts and ends. The critical soil temperature for microbial activity is called biological zero, this is when the soil temperature at 20 inches is at or below 41F (5C). Below this temperature the soil is considered dormant for soil morphologic development of redoximorphic features. This is very important because the soil monitoring wells will often show water tables higher than the depth to redox features identified in the soil test pit. This high water table is not recorded in the soil because it often occurs during the winter months when the soil is below biological zero. Redoximorphic formation requires the soil to be above biological zero and saturated for a period of time (typically two weeks during the growing season). For more information on soil temperature and growing seasons click HERE. The data from the wells is recorded in a spread sheet along with other data collected. The spread sheet data will be made available for each well along with graphs and statistical data. The intended use of this data is to assist town health agents better effectively guide on-site wastewater disposal system location, design, and permitting. A major component of this process is proper soil evaluation for the estimated average depth of seasonal high water table. This depth is determined by the guidelines described in Title V (310 CMR, section 15.103-3) by a licensed soil evaluator. The index wells will help in the determination of the start and end of the wet season and provide a reference to compare proposed systems on similar soil and landscape positions. An example of the use of these wells is the situation which occurred during the early winter of 2002, a time of extreme drought conditions and record dry conditions. Readings made during early January, a time when water tables should have been at or near their highest, had most of the wells completely dry. January 2002 was not the start of the wet season. The Title V code requires that reference materials of the site of the proposed new system be included with the soil log. The soil survey map is one of the required reference materials on the form (NOTE: when working in Plymouth County check to see if updated soil mapping is available, go to http://nesoil.com/plymouth for more information. The updated mapping will be more accurate for on-site septic system limitations than the old 1969 survey). The index wells are referenced by soil type (Woodbridge series for example), landscape setting (e.g. convex slope of a drumlin), location by town, and geologic deposit (e.g. glacial till). Below is a table with each wells information and a map showing the distribution of the wells. To use the data try to select a well that best matches the site conditions of the site of the proposed system (match soil type, geology, landscape, and nearest location) and click on the well to go to its data site.